In the hospital,fog phase, there is a photo of a girl in front of a blurry building with what looks like a ufo behind her, in-joke picture maybe? thad be neat. Also there is a very bright and colorfull picture of flowers in the office.which is wierd. In the other church,after going though the antique store, the plaque next to the axe reads "B1 section 1-A Center Supply Water, Gas, Electric power"
Was there a real Paint Bay that inspired that texture? It looks like it could be Print or Faint possibly. The developers could have just been having fun with random words, too. Oh yea....i forgot about the numbers..... And there is something else i just remembered but did'nt write down, there might be a hidden pixel picture behind the painting hung in Allessa's hospital room in Alchemilla. If you walk up to it and look back and forth the painting will glitch away to reveal a strange arrangement of pixels behind it against a black backround. looks like an airplane to me or something. I don't know if walking through walls is required to see it but while i was looking around the game for all this hidden stuff i usually had it on. 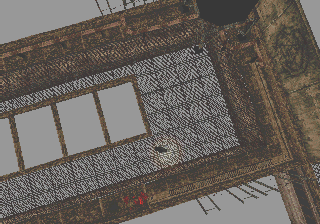 Giromancy has always had a keep eye for Silent Hill 1 details, and noticed some strange things about the maps in the first game. Most of the places Harry visits are colored in pink to distinguish them from buildings you canâ€™t visit. However, there are some pink areas you cannot visit. 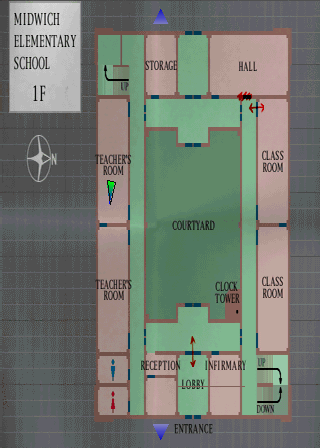 As you know, the pink points on the maps are key places to explore, all the pink places like the: School, Church, the bridge control room and the sewer entrance, are key places to proceed with the story of the game. 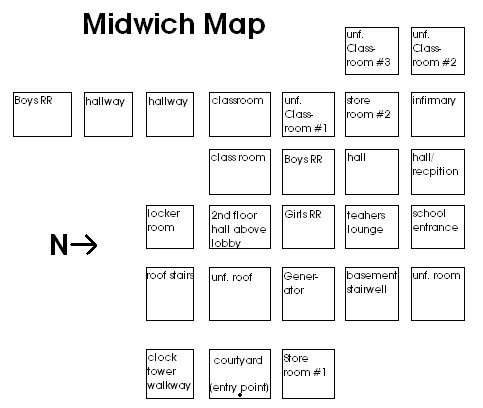 The places marked with violet color are places where did you find key items but not to proceed with the story of the game, like the: Gas Station and Convenience store 8. There is a rumor that the pink points that appear in the OLD SH & Central SH map that are not accessible, they were key places to visit with Cybil, for some reason Team Silent forgot to change the color to those areas. Some people have speculated, over the years, that these were intended for a Cybil sub-scenario thing and that she could visit them. However, there is no real evidence that they ever worked on making Cybil a playable character in the first game. This is the door thatâ€™s pink on the map. 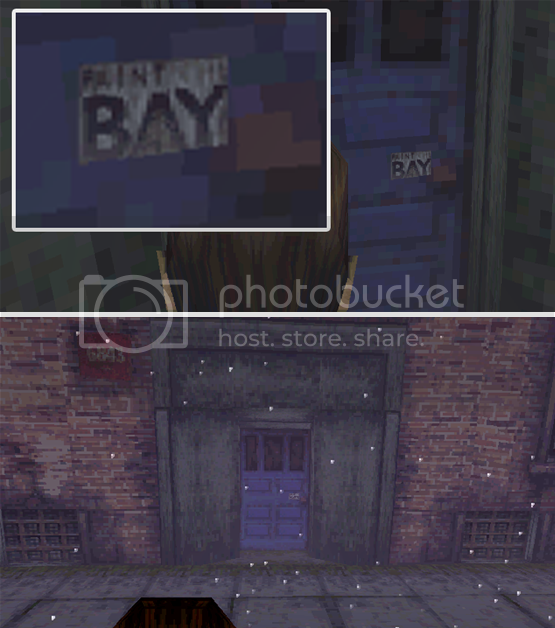 In the above diner image (resort area), Harry comments on the door. He usually doesnâ€™t do that to buildings that you canâ€™t enter, so maybe this was intended to be an area he could visit. He also posted the image above. See the little Pennywise the clown at the bottom left! And the Barbar Shop and Bennyâ€™s which also didnâ€™t make it into the game, which leads me to wonder if these textures may have been intended for areas that were never finished, rather than just stuff they decided didnâ€™t fit. Of course, in the texture file above, that is a fuckton of Stephen King references, and maybe they decided it was too much. Haha, IT. Oddly enough, I've never noticed him before. Awesome. Of interest, the roof actually has a forced camera angle showing the stairs furthest from the "door". It doesn't seem like it's set up properly since it only seems to take hold if you're walking towards it from the door... Maybe it was originally designed to show you the stairs since the usual camera angle isn't too good for it. If you move into those holes in the floor, you fall down through them and die. Interestingly, walking off the edges of the roof doesn't do this, just the pits in the middle! Work in progress, though, but at least I have total control over the camera. ^That first video was just strange. It shows how much the fog and darkness does in order to increase the scare. That's an amazing work ! It's interesting and as Jonipoon said we can clearly see how the fog was necessary ! I like how we can see more details ! I am meaning to redo all my old videos and things in better quality but am working on SH2 camhacked LP first. You posting this has now got me watching the cam hack videos at the side, nice one! I find this kind of hidden content really interesting! Well, all credit to jam6i for finding the thing, but it's amazing that people are still finding cool stuff about this game after all these years! Eventually will do a playthrough of this one, too, to collect most of these sorts of things all together. Lots of cool stuff in Sh1 though! That is amazing! I love that there is still stuff in this game that hasn't been found yet! I am working on a side by side LP video of the OPM#16 disc and the final game. Here are some screencaps detailing some of the differences in â€œScene 1.â€ I will be adding â€œScene 2â€³ (School) soon also, as well as putting the ripped images from the game that donâ€™t actually appear in the demo back up, and will also be noting some of the changes in other demo versions. There is a lot of dialogue changes or rearranged, but I will leave that for later when I get my old pages that were lost from my site back up again. This is the title screen for the demo disc. The controls for the demo. Konami is in italics in the demo. Harry is closer to the bottom of the screen in the demo version loading screens. The pole is darker in the final game. Harry doesnâ€™t comment on the wheelchair in the demo. Harry doesnâ€™t comment on the gurney in the demo. Several things on the map are different. In the demo, there is only a map and a flashlight on the counter. In the final game, there is a map, a flashlight, a health drink, and a save notepad. The line â€œyou got meâ€ was removed from final game. Also, there is no voice acting in the demo and the seat colors are different. There was no â€œHuh? Radio?â€ in the demo. Brilliant as always, Amy. Thank you for sharing! Thanks. 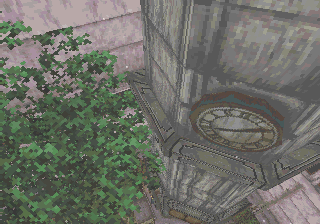 I am working on a LP of SH1 with similar demo comparisons, references, textures, etc but it's taking a while to edit. second 15 min or so, mostly finished with regular school, almost to alternate school.